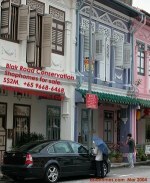 South Singapore. 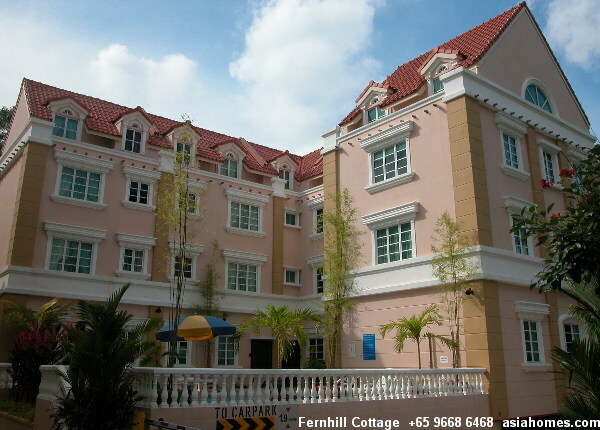 10 units of cluster townhouses only. 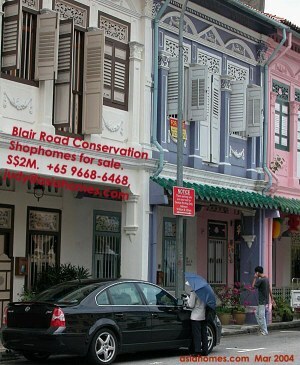 Near Whitley and Thomson Road. 3-bedroom maisonettes - lower floor. 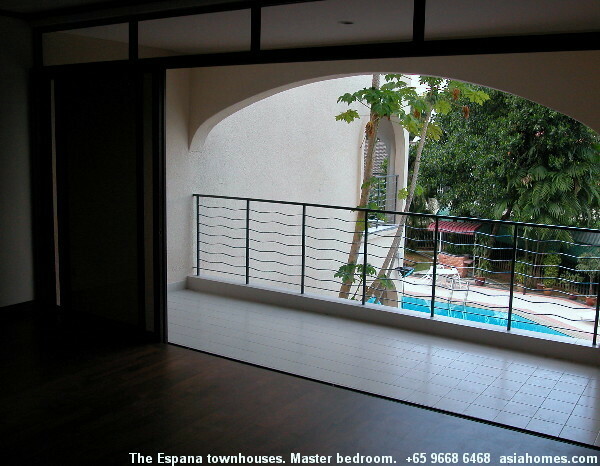 Large balconies off dining area and one bedroom. 2 bedroom units - 1 level but extremely spacious bedrooms and living and dining areas. One utility room has the washer and dryer, sink and shower for guests. Suits expats who want low density living and privacy in a leafy residential suburb, within a 5-minute drive to downtown Orchard Road. 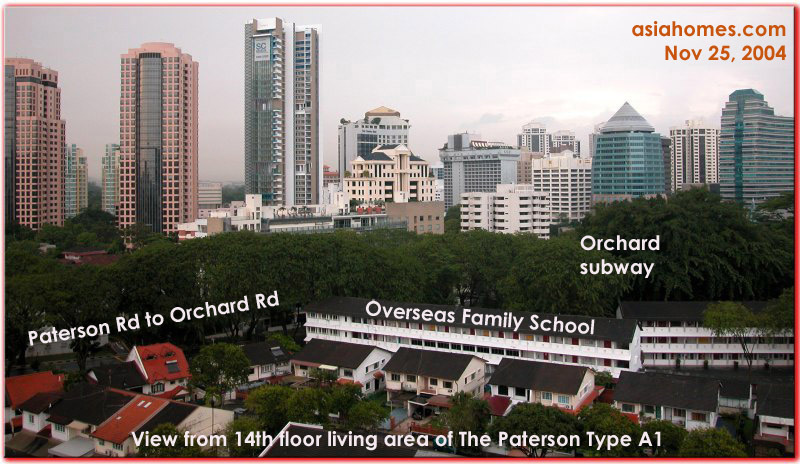 NOT within walking distance to the Novena subway but it is a 1-minute walk to Whitely or Thomson Road. 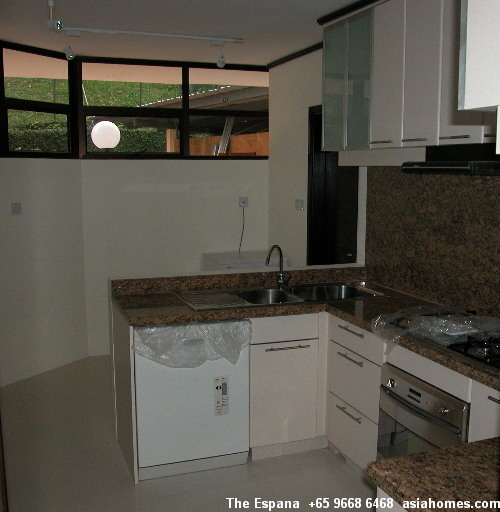 Espana townhouses are rarely available. Cluster houses. Hillcrest Road. Off Dunearn Road. 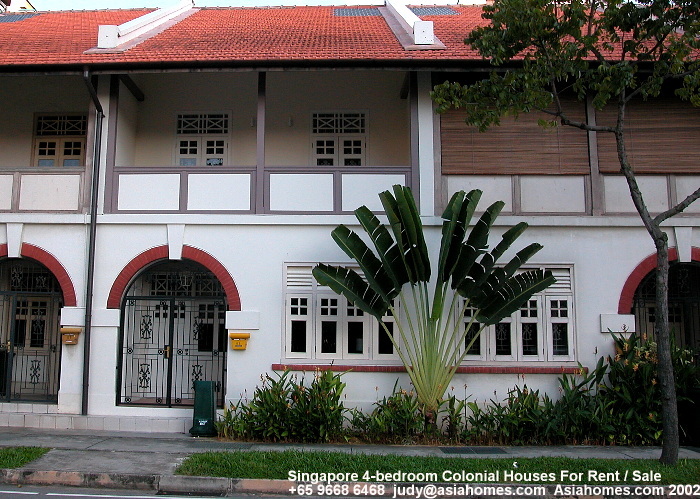 3-storeys with basement. 2 bedrooms on 2nd floor. 2 bedrooms on 3rd floor. Basement can be playroom for the children. Car parking underground. Completed: 2009. 163 units. 9 units face the lap pool. Built-in area is around 2900 - 3200 sq ft. Most units face one another. Facilities: 3 swimming pools, steam sauna, gym. playground, exercise area and function room. 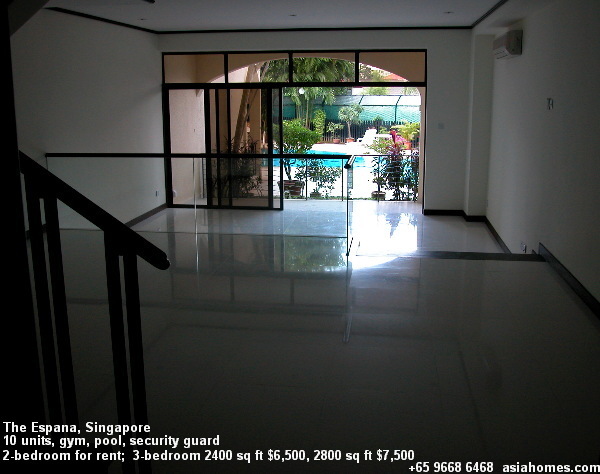 For Rent By Realtor: Hillcrest Villa 5-bedroom 3200 sq ft $10,800. 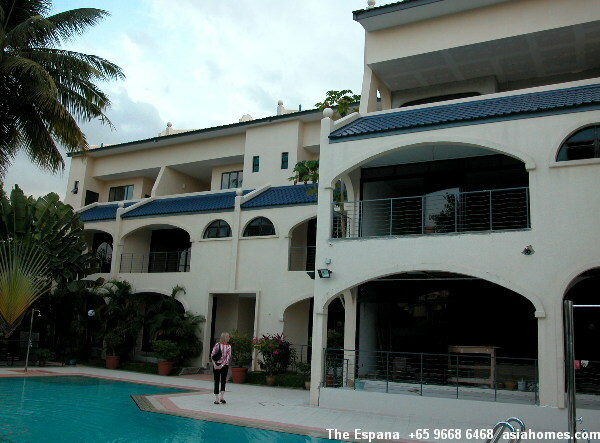 Expat Wants: 3 big bedroom condos $6,000 - $8,000. Office at Suntec City. No children. Couple but with in-laws visiting often. Prefers 3 bedrooms with 3 attached bathrooms. 2.15pm Scotts 28 3+1 2035 sq ft $8,500.Upscale condo. Has 3 attached bathrooms. 2.30pm Chelsea Gardens 4+1 2508 sq ft $8,500.Upscale condo. 2.45pm Avalon 3+1 1765 sq ft $6,500. Upscale condo. 3pm Anderson Green 4+1 1916 sq ft $8,000. Upscale condo. 9.30am Regency Park 3+1 3100 sq ft $8,500. Greenery views. Has 3 attached bathrooms. 9.45pm Beverly Hills 4+1 3800 sq ft $8,800. Greenery views. 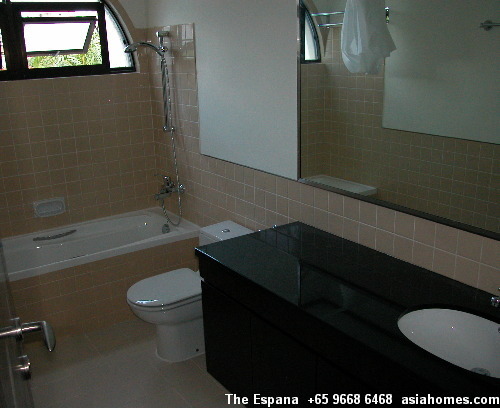 Has 3 attached bathrooms. 10am Leonie Condotel 4+1 2800 sq ft $9,000. 16-03. Rectangular long living and dining area. 10.15am Grange 80 4+1 2314 sq ft $9,000. Upscale condo. 10.45am Pebble Bay. Lobby G. 4+1 2626 sq ft $7,500. Waterfront views. East Coast. Upscale condo. Husband may dislike high density living, being a hotelier. 11.45am Nassim Woods 3+1+family area. Exclusive. Upscale condo. Great location. 35 units only. 266. 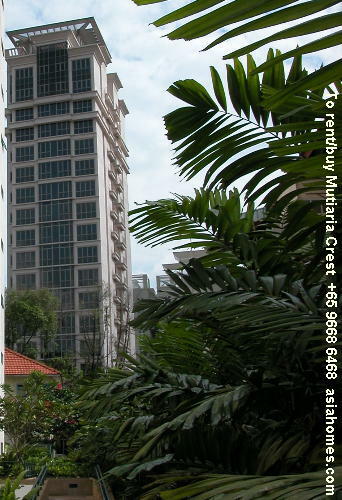 Mutiaria Crest penthouse for rent. 4+1 3,897 sq ft. Roof terrace and roof top spa. 2 levels. Great city and greenery views. 2 min taxi to Orchard Road. 264. 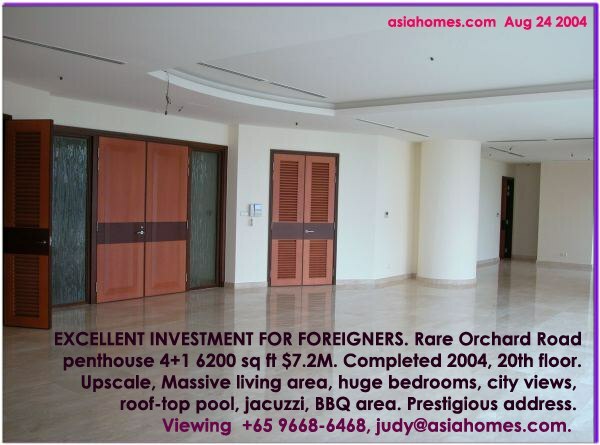 The Paterson is an excellent investment condo for foreigners. 263. 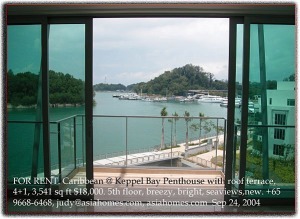 Caribbean @ Keppel Bay. 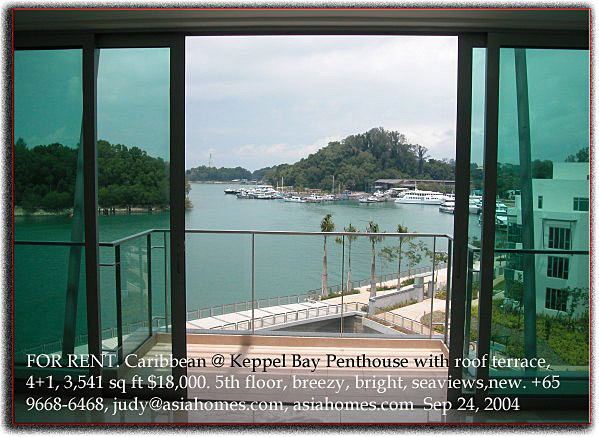 3 brand new sea-fronting penthouses for rent.